Cover Artwork: Photograph by the author. In this collection Andrea Potos exults in images of luminous earthly beauty – a blue scarf lake, Greek bread that tastes of heaven and salt, cobbled streets shining like jet in the rain – that also hint at the inevitability of loss. 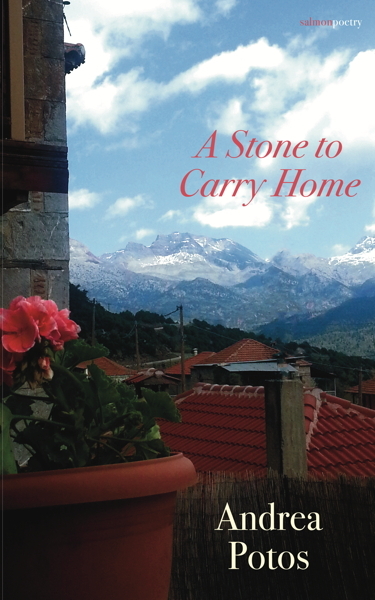 In these poems, Potos prepares to watch her daughter leave home and then takes us with her and the daughter on her journey to Greece and into the mountains of her ancestors, where eventually they arrive to the ruin that was once the home of her beloved grandfather. There is a sense of resilience in the talismans she evokes – cut fresh lemons and olive oil, stars in the sky that light up the stones at night, and of course, the stones themselves – that image by image bring past and the present together to offer a deep and expansive sense of home. "Andrea Potos’s poems in A Stone to Carry Home are careful and tender, skillful and strong. She captures the poignant and inevitable separation of mother and daughter (Trying to Talk to My Daughter) and embraces her Greek heritage (My Grandfather’s Home). She describes “never so many mothers/steeped in the fresh/milk of each moment” (In the Café Where I Write) and shares “a blue and white flag answers the wind” (At an Athens Window). You will find her word work wonderful." 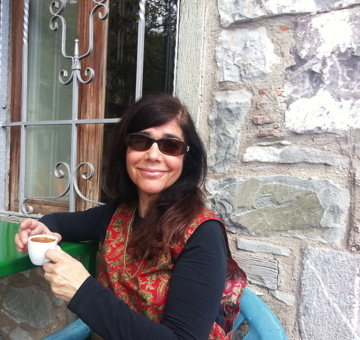 Andrea Potos is the author of seven poetry collections, most recently Arrows of Light (Iris Press), and An Ink Like Early Twilight (Salmon Poetry). Another collection We Lit the Lamps Ourselves was also published by Salmon Poetry, and Yaya’s Cloth was also published by Iris Press. Andrea has received numerous awards for her poetry, including the William Stafford Prize in Poetry from Rosebud Magazine, the James Hearst Poetry Prize from the North American Review, and three Outstanding Achievement Awards in Poetry from the Wisconsin Library Association. Her poems are published widely in print and online, including in Poetry East, Tiferet Journal, Presence, The Blue Nib, Headstuff, Women’s Review of Books, Atlanta Review, Heron Tree, Peacock Journal, The Sunlght Press, and many others. She lives in Madison, Wisconsin with her family. sprout across the uneven grey. to make room for the girth of her reach. from the background that held them. that have settled within you. give your attention to this world.